Happy Sunday to you all! As you know by now, Sunday’s are my absolute favourite day of the week and despite the freeeeeeeeeeeezing cold weather, today is no exception! It’s freezing I tell you… snow is forecast for Wellington tomorrow… it’s spring. It won’t snow in the central city of course, just on the hills, but still. Icy winds galore. I took my bunting outside just before to photograph it and wow… my fingers froze, I had goosebumps, the lot! Brrrrrrrr! It really is quite festive isn’t it! I used 8ply gorgeous Ashford Tekapo wool and it came out brilliantly. First, make a magic ring… do you remember how to do that? If not, click here and a photo tutorial will pop up, along with instructions on how to do dc2tog. Also, click here for a tutorial on how to do dc3tog. …. To begin, ch3, dc2tog (counts as 1 dc3tog), ch2, dc3tog, ch2…. until you have 6 dc3tog each joined with 2ch. Join with a slst to 3rd ch of original 3ch. Join next colour into one of the 2ch spaces, ch3, dc2tog (counts as 1 dc3tog), ch2, into the next space *dc3tog, ch 4, dc3tog* (you just made one corner space) ch2, dc3tog into next space, ch 2, repeat ** to make next corner space… continue around until you have three corner spaces separated by 1 dc3tog and 2ch between each cluster. To make the third round, join the next colour to one of the side 2ch spaces, ch3, 1hdc (counts as 1 dc2tog), ch1, into the same space, dc2tog, ch2, into the next space *dc2tog, ch1, dc2tog* ch2, into the corner space, dc3tog, ch4, dc3tog, ch2 into the side spaces repeat ** and continue around the circle until all spaces are filled and separated with 2ch. And now for the edging… I love this, it’s so pretty and ruffly! This edging has a right side and a wrong side, so working with the right side of your bunting facing you, take a new colour- it’s best if it contrasts…. and join to one of the corner spaces with a slst. 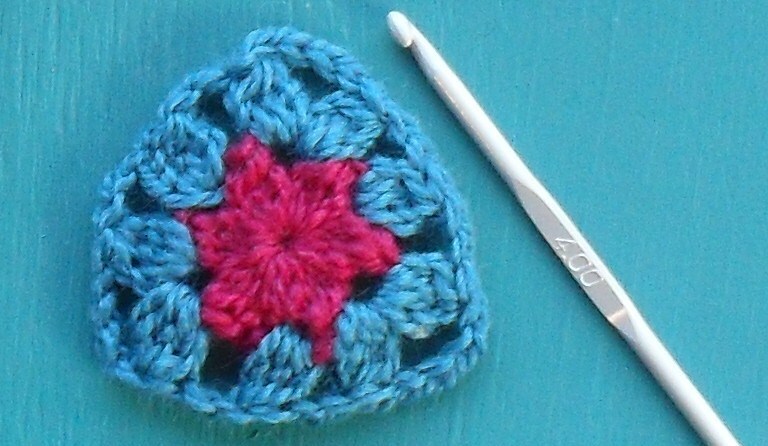 Slst into next stitch, ch3, slst into next 2 stitches or spaces, ch3….. until you reach the next corner space. When you reach that corner space, into the space, make 1 slst, hdc, dc, ch3, dc, hdc, slst, ch3, slst into next 2 stitches, ch3, slst into next two stitches and so on and so on until you reach the last corner space. Fasten off. So there you have it, one completed bunt! Make five or however many you are planning to make! I’ve been making mine in sets of five, with one colour in the centre, then two of each combinations at the sides and I quite like the symmetry! And single crochet them together! I usually ch10, join with a slst, ch 10, sc along the top of bunt number 1, ch5, sc along next bunt, ch 5……..
Beautiful bunting blowing in the icy wind…. Where was Raymond during this photoshoot you may ask? I’m off to drag the heater out of hibernation and put on a second pair of socks! 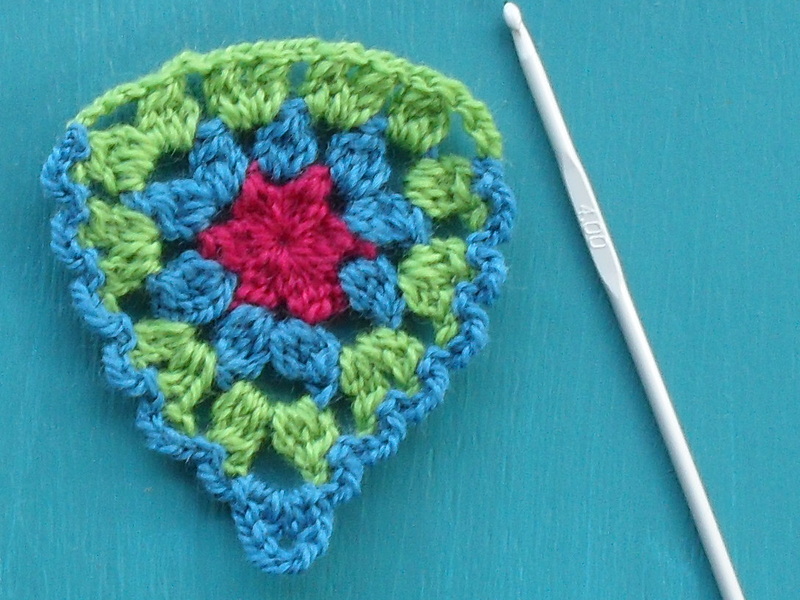 This entry was posted in Bunting, Crochet Goodness, Patterns. Bookmark the permalink. 34 Responses to Bunting Time! What’s the difference between a bunting and a garland?? Mine. Thanks for braving the cold for the great photos! Hullo Alice and Raymond, wow you have been so busy this last week. How wonderful. 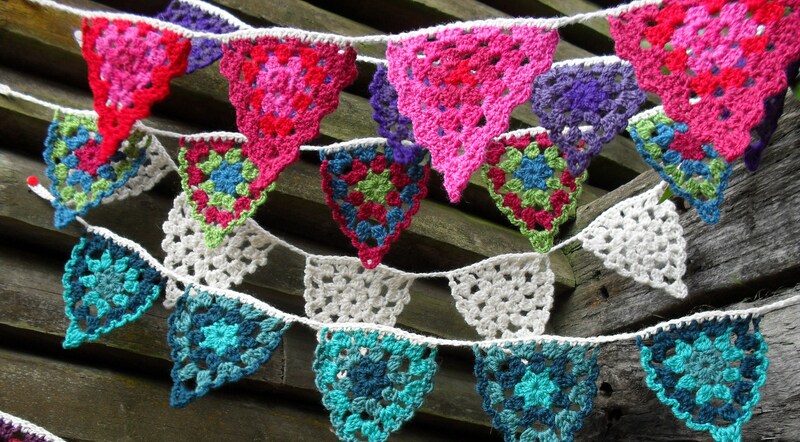 Loving your bunting, such lovely colours. Guess what I’ll be making today. Just love them. Thank you for sharing your pattern. It’s a grey, wet and on NZ standards COOL day here in SE Queensland, Aus. Have been browsing your pics lately and love the cheerfulness of your colour choices. Nothing like a bit of colour to brighten our days. I love it! The pics with all the bunting strung up together looks great! I made some garter stitch bunting using your tutorial and will be giving this one a go too!! Yes, they all look very festive and loving the colour combinations. I think I will have to give this a ‘backwards’ go, being right-handed. Hello Alice! How wonderful they look all together – different colours waving in the wind! I just have to make some! I’m having my late sunday morning coffee and we have also quite cold weather – here is autumn. Thank you for your tutorial and lovely company! Fantastic!! Glad you like the apples. So, bunting today then. Sooo beautiful! The colourful ones remind me of little gum drops. I absolutely marvel at your ability to knock these off so fast! You’re like a machine! I love the picture with all of your buntings together! Hey there! Those buntings are beautiful! I love the way you use various colors in your projects. They are absolutely stunning! Have a happy and cozy day! 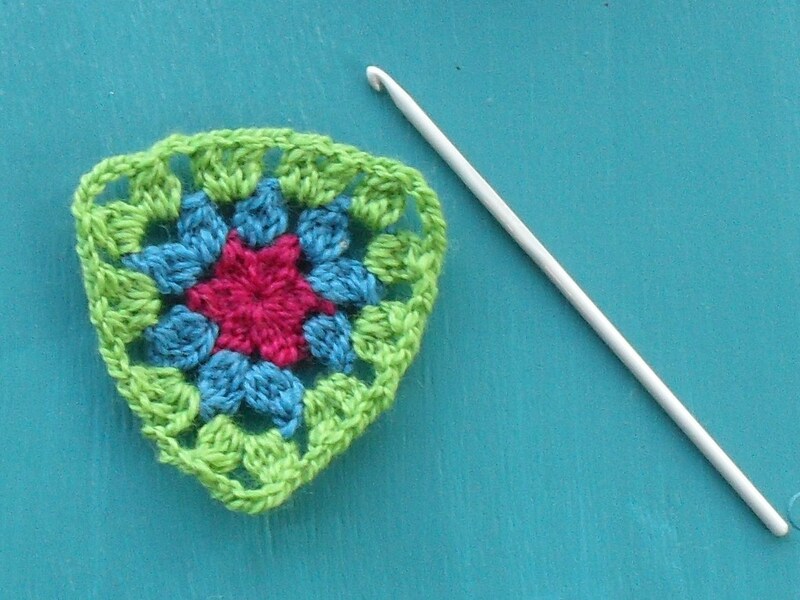 When the hot weather returns you could use these lovely crochet shapes to make a really groovy sixties bikini, lined of course ! yeh baby yeh. Fabulous bunting! The colours are just so vibrant and beautiful. 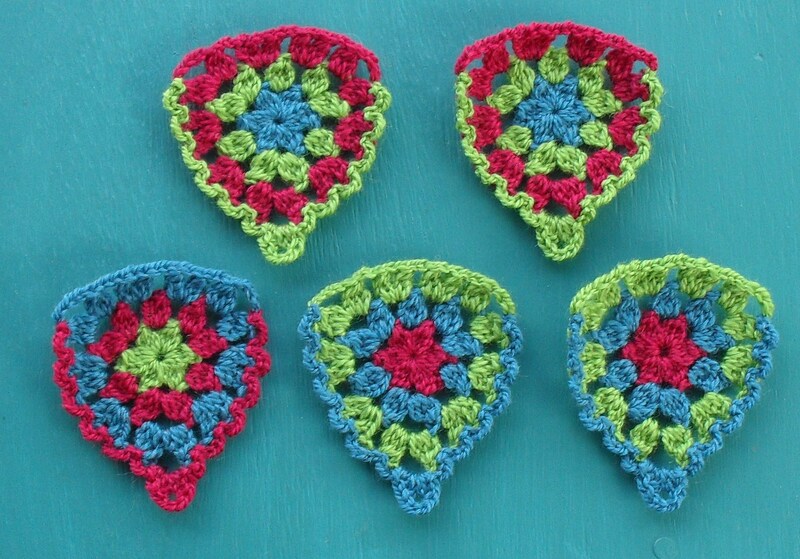 I might like to give this a try for some christmassy bunting. thanks for the tutorial. 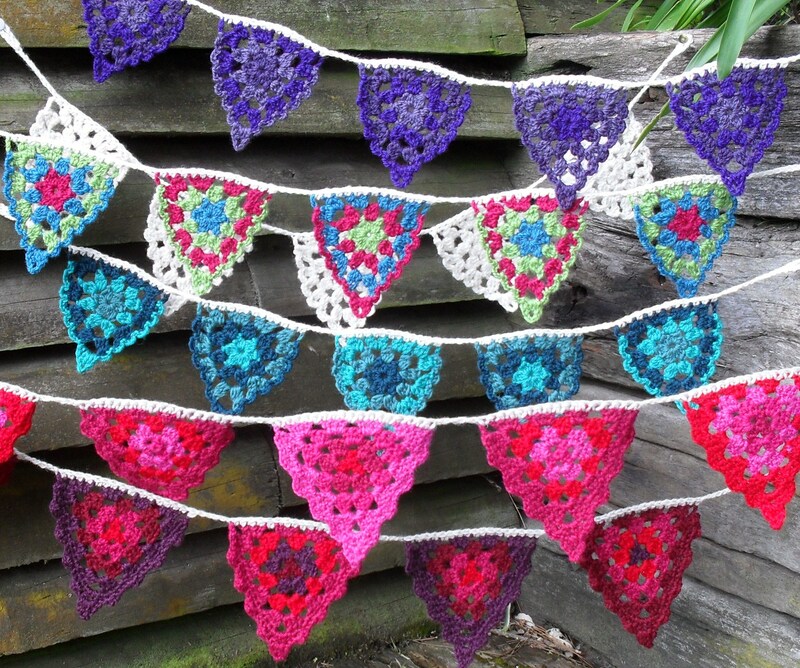 Ahh, bunting love, the purple ones stand out with the combo of the colors, they are all gorgeous. You were freezing with snow and we had a beautiful sunny day and today is beautiful again and we arn’t that far apart, but far enough. I had a crochet bikini and it was lined and when it got wet it stretched, very embarrasing for me…….the lining was stretchy too…..arhhhh. Have a great day, hope it is warmer today. 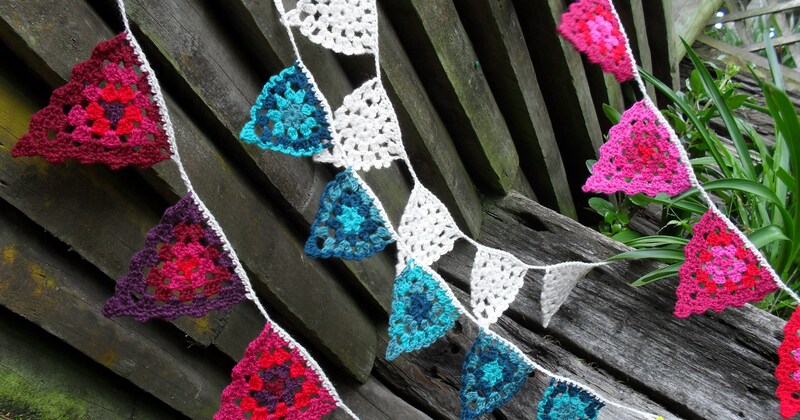 Totally loving the multi-coloured bunting pictures! Don’t the white ones look great for Christmas? I think these will look great just about everywhere. Love the pattern; thanks so much for sharing it with us! beginning to be nervous of visiting your blog-my ‘make it next’ list is more like a book at this point and each visit here adds another chapter! I LOVE this Alice…..as soon as my granny blanket is finished, I’m making me some bunting! oh these buntings are lovely! im glad i found your blog. so full of inspiration! Hi! 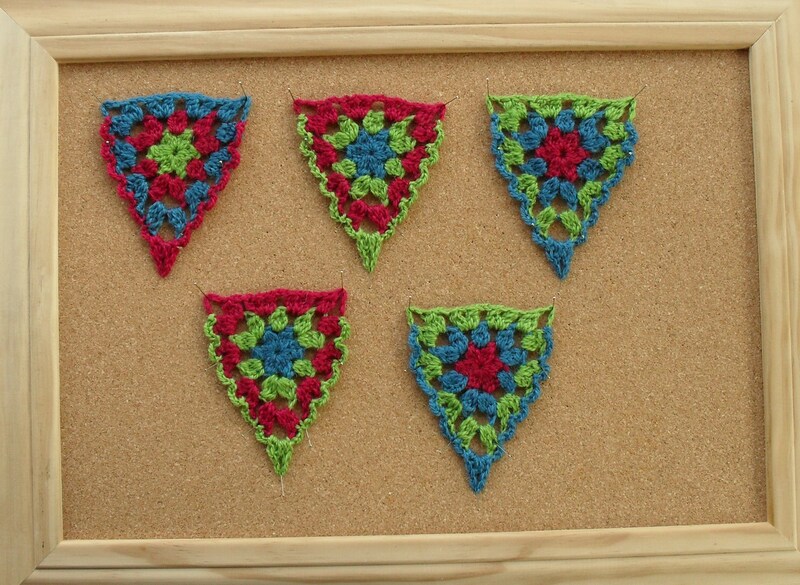 I’m using this bunting for my next yarn bomb! Stay tuned and I’ll let you know when pics are available. It should drop tomorrow! loved your work.And great pics..I am inspired to take up crocheting if I can make something as lovely as your work. absolutely loved it! will try asap!